The Boat Club departed for Seville on the final morning of the Autumn Term for the first of two training camps this season. 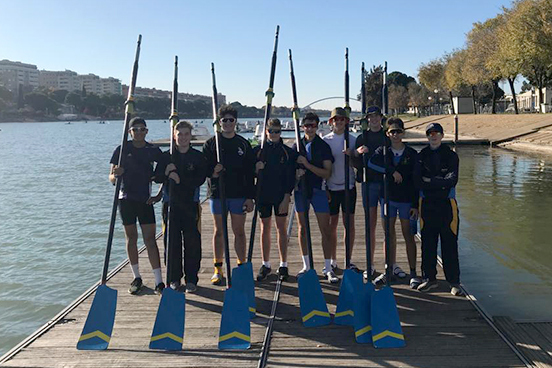 In spite of an early start spirits were high and the Boat Club got straight to work on arrival, rigging and out on the water the moment they arrived in Spain. The longer river and perfect conditions meant that great progress was made and a thoroughly pleasurable experience was enjoyed by all. 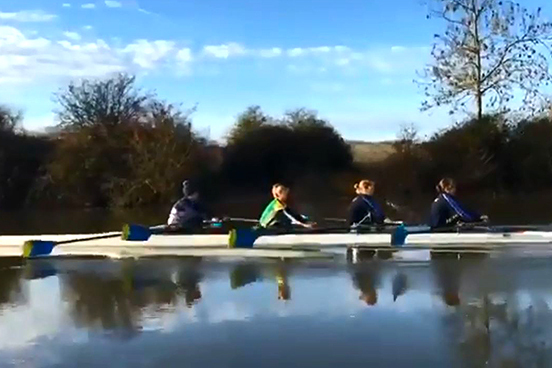 The girls were out in their singles, doubles and pairs and joined by a different boy from the 16’s every day made some really encouraging progress whilst the senior and J16 boys trained in the Eights they would be rowing in at the regatta the following weekend. Tuesday evening saw everyone having some down time and playing in a highly competitive game of football. The teams were the senior boys and coach, Tristan Mayglothling, against everyone else. The senior boys’ side found themselves 2-0 down, but put on a bit of a tactical masterclass to pull it back and win 9-5. A series of time trials down the regatta course mid-week generated some extremely positive results, and a special mention must go to Isaac Brown from the J16s who completed the course well in a single scull despite having not been in one since he was in the Shells. On Thursday the touring party returning to the football pitch, this time to watch Sevilla play Krasnodar in their Europa League game. The squad got very involved in learning the chants and by the end of the game many of them were able to join in with gusto (even if they didn’t know what they meant)! During the weekend’s regatta the touring party were involved in a number of races across all the different boat classes and categories. An excellent attitude was shown by all involved with results to match. On home waters the younger members of the Boat Club were in excellent form too, with an impressive commitment shown and some valuable technical and endurance sessions completed in tranquil conditions on the Thames. You can watch some of the junior crews in action practicing some square blade rowing on the Teddies Rowing Twitter feed here.